As promised, I bring you the fruits of e-mail interviews with the performers in the upcoming Pre-Fixe Cabaret (I am ashamed to tell you how very, very long it took me to get that pun). First on the menu: Non Edwards! Non Edwards and her awesome name are not newcomers to Patrick’s Cabaret. In the summer of 2007, she performed here as part of Nora Bichler and Carla Bode’s Fringe Festival show “That Which Binds.” She’s been dancing since she was four or five, and took ballet and jazz through high school. However, she says, it wasn’t until she got introduced to modern dance her sophomore year at Grinnell College that dancing became the staple of her life that it is today. After just one year studying with Shawn Womack, she was completely, utterly, absolutely hooked. Shawn continues to be a huge influence and inspiration, with Non saying that “her performance quality has really stuck with me, and I think she’s a brilliant and poignant choreographer.” She’s also a big fan of Ohad Naharin, though she regretfully notes that she has not seen his work live. For her upcoming performance she will be showing three pieces. 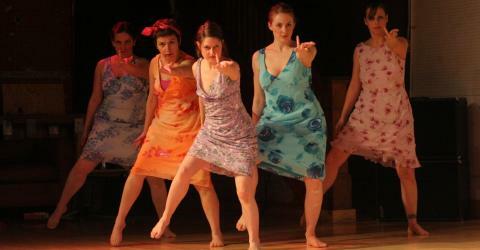 The first is an excerpt of a longer piece called ‘Lifeboat.’ For this trio she says, “I spent a lot of time reading about the atomic bomb–its creation, its lingering effects today, and what it would feel like to have the decision of life or death on one’s hands.” She originally choreographed it in spring 2008 while dancing with the 940 Dance Company in Lawrence, Kansas. She also spent a lot of time developing movement in the studio alone and putting it on the dancers during rehearsal and seeing how things evolved. Right now Non says that “I really just want to do as much as possible at this point to kind of figure out what I want. I am interested in doing really physical and visually pleasing work right now, but that’s not to say I don’t appreciate or want to be making more conceptual work in the future…And I’d love to be performing work other than just my own, so if there are any choreographers out there looking for a dancer, let me know!” Anyone looking to get in contact with her or join her e-mail list can shoot her a letter at NEDanceWorks@gmail.com.